I have another Valentine to share today. 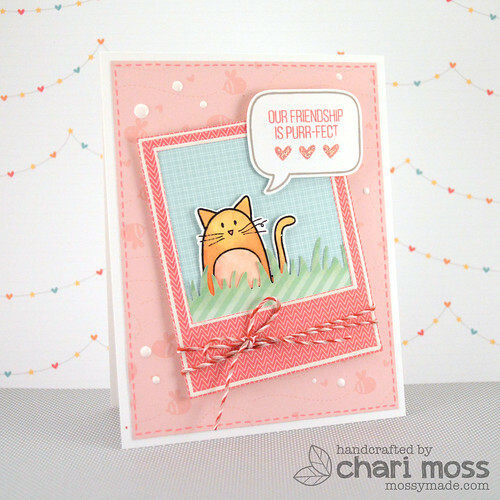 I made this care with Hello Sunshine papers from Lawn Fawn and the Simon Says Stamp Quite the Pear stamp set and matching dies. I embossed the kitty and watercolored him. 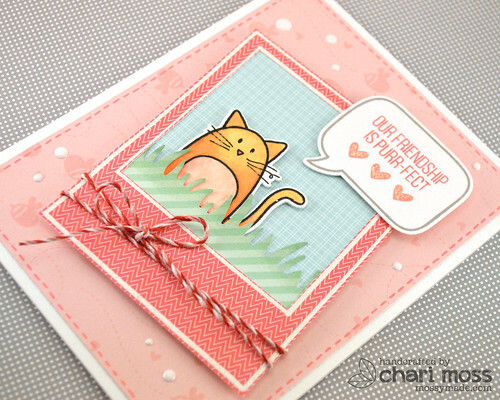 I used a speech bubble from Lawn Fawn's A Birdie Told Me set for my sentiment and used the Say Cheese polaroid to frame the little scene. I finished off with some sweetheart twine around the bottom of the picture. The white enamel dots were made with wedding dress Memento Pico embellisher and I used a pink gel pen to draw faux stitching around the pink background panel. Thanks for stopping by today! I have another Valentine to share tomorrow. To get the white border around the picture frame did you just stamp the stamp using white ink? I embossed it with white embossing powder. ACK! This is so cute! Such a sweet card! That sentiment is adorable! Super cute! Love these colours! I love this card and the colors you chose! I follow your blog because I love all your creations, but also because we have another love in common- our wiener dogs. I have Frankfurter at home and my blog is named for him. www.lifewithawienerdog.com Just had to finally take the time to write and tell you. Thank you for all your inspiring work!